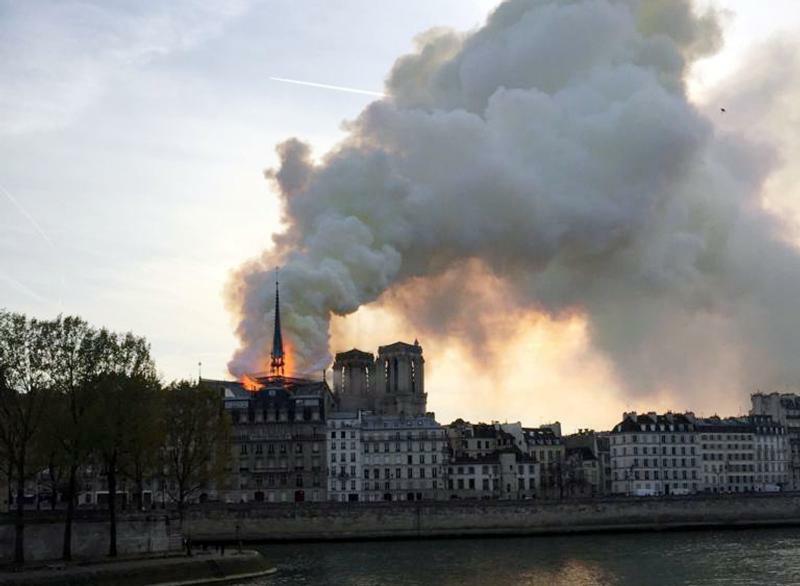 Two hours later, Paris' archbishop wrote on #NotreDameCathedral: "To all priests in Paris: firefighters are still fighting to save the towers of Notre-Dame de Paris. The frame, the roof and the boom are consumed. Pray. If you wish, you can ring the bells of your churches to invite to prayer." 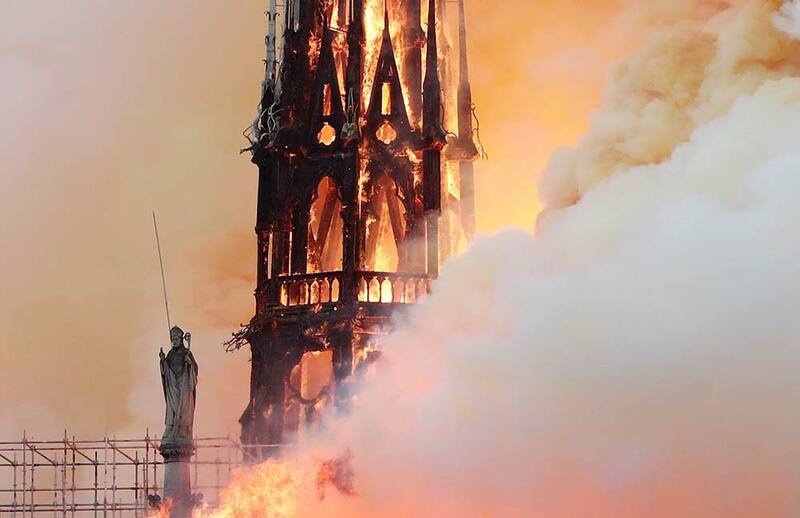 Shortly before midnight French officials announced that both towers of the cathedral were safe, and that the fire was cooling. Crowds at first watched the blaze in shocked silence. As the hours wore on — as the cathedral's spire toppled and its roof crashed in — more and more began to sing hymns, some on their knees. 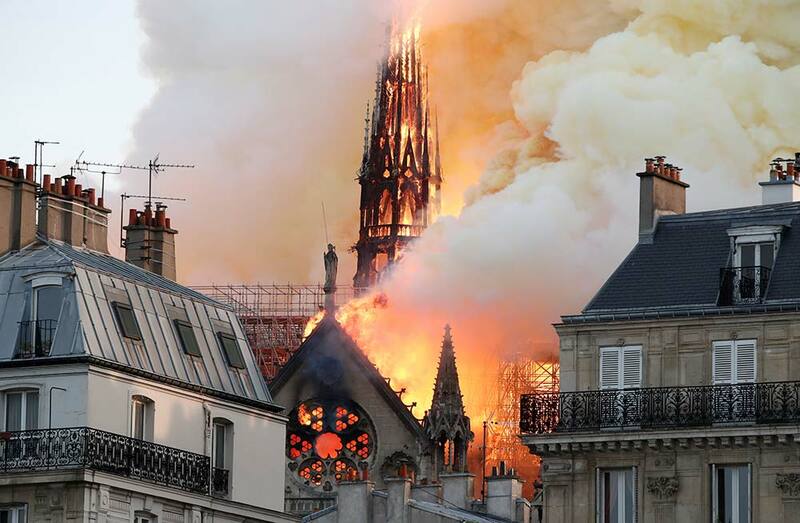 "Our prayers are with the people of Paris as the iconic Notre Dame Cathedral is burning," said Archbishop Alexander Sample of the Archdiocese of Portland. "Our beautiful churches and cathedrals point to the glory of our God and His creation. As we enter this most Holy Week of the year in preparation of Easter, we rest in the peace of the Resurrection and know Christ will console us in our most tragic times." The New York Times, in its coverage, quoted Parisians, many of them in tears, one saying "Paris is beheaded," after the spire fell. U.S. President Donald Trump also expressed concern for the cathedral in a tweet, writing, "So horrible to watch the massive fire at Notre Dame Cathedral in Paris." He offered a suggestion on how first responders could tackle it: "Perhaps flying water tankers could be used to put it out. Must act quickly!" France's civil defense agency, evidently responding to his suggestion, said such a drop of water on "this type of building" could result in the collapse of the entire structure.